Not everyone likes to travel. In fact, for some people travel can be stressful. 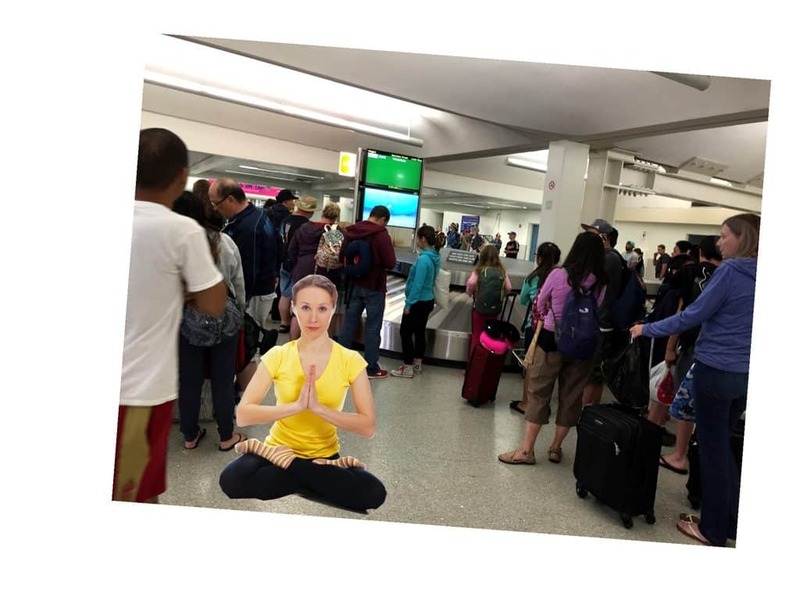 If you are someone who gets anxious when flying, worries excessively, feels a lack of control, or isn’t experienced at travelling and finds the experience overwhelming, then read about mindfulness and how you can practice it during your next trip. Being mindful during a long trip can help you keep emotionally and physically balanced. Mindful activity can help you stay refreshed when everything else is new, stressful or in flux. We live in the present—at least our bodies do. Most of the time, however, our minds frequently aren’t. The thoughts of an untrained mind are often in the future or in the past; and when we are mentally in the future or past, we are not in the present. When your mind and body are in sync in the present we can practice mindfulness. Being mindful is the act of being in the present moment and in control of ourselves. When our minds wander in the future, we rehearse scenarios (what could be), and we forget to look at what is happening now. When we are mindfully in the present, we can control our actions, thoughts, and attitudes. When you practice mindfulness, you can even learn to change your thoughts and attitudes about things or situations. Quite frankly, the airport is a great place to practice mindfulness! Practice being in the moment by doing and thinking about the thing you are doing (or are supposed to be doing) right now. When a thought about what comes next or what has already happened enters your mind, acknowledge that you are thinking in the past or future and guide yourself back to the present. When you approach the baggage check-in area and while you are there, think only about that experience right then. After your bag is gone and you have your boarding pass, that experience is finished and gone. If you begin to worry about your bag getting lost or being sent to the wrong place, acknowledge the thought and then let it float out of your consciousness. Try not to worry about problems that do not exist. Next, when you go through security, listen carefully to the security personnel, do what is necessary and think only about that experience. After you pass through security, that experience is gone. Next, you wait for your flight at the gate. You can choose to meditate or practice being mindful. Keep your mind in the present as much as possible. It wastes your energy to worry about world events, the airplane or actions of other people, or some mistake you made yesterday. If someone is unkind to you along the way on your journey, you might want to practice forgiveness and let the unpleasantness go. The unpleasantness, whatever it is, will end when you let go of it. While in flight, you can eat in a mindful way, listen to a guided meditation, or look at something in a new way. After your flight, you can walk in a mindful way and adjust to your new surroundings. These are some great activities to do in the airport before you take off, during your flight, and after you arrive at your destination. To walk mindfully, your mind and your body do the “walk”. You move regularly and deliberately. As you take a step notice how your weight moves from your heel to the front of your foot. You notice your movement, weight and balance. Your mind is engaged in the act of walking. When a thought about something else enters your mind, acknowledge that your mind is wandering, drop the random thought, and return your focus to the walk. Practice a guided meditation or listen to a podcast about mindfulness. Eat in a mindful way. We all have to eat, and mindful eating is a special experience. You might choose to try a mindful eating experience before or during your flight. You can start with something small and healthy, such as one almond or a raisin. Before you put the almond or other small food item in your mouth, look at it, touch it, and smell it. Put it in your mouth and roll it around to experience its shape and texture. Next, bite into it and experience its flavor. Chew it deliberately, and then swallow it. If you continue to eat this way, you will tend to eat less overall and experience satiation. Do gentle yoga or stretching and airplane seat exercises. Observe plants, fish in an aquarium, or art in an airport terminal. Some airports are out in the open, so you can even watch the birds.For example, I love to watch the fish in the tank at Terminal A at the San Jose International Airport. Make a travel journal and sketch, draw, or paint where you are right now. When you begin to practice mindfulness, you might notice that it doesn’t come as naturally as it sounds like it should come. You might even be unsettled when you try to focus on the present and find that you just can’t. An undisciplined mind is everywhere at once—the past, present, and future. Observe the random thoughts from the future or past or whatever comes into your mind. Acknowledge that the thought exists, and then return your thoughts to the present. If you are noticing the past and future random thoughts, then you are doing the practice correctly. Take care to avoid assigning a judgment to your thoughts. Things such as “what a stupid thing to think” or “I can’t even do this” are not helpful. If you notice your mind doing wandering away from the present, acknowledge the wandering, remember that you’re human, and return your mind to the present. Realize that sometimes it will be easier than others to be in the present. Mindfulness classes are becoming popular, and instructor-led classes are available in many cities. Enter “mindfulness programs” into your favorite search engine to find programs in your area. Continue the conversation on the TripCompanion Facebook page.We’d love to hear about the mindful activities that you do while traveling.